Good Morning! I hope you are having a great week so far! It was a laid back weekend for me which is always good so that I can rest up for the work week. Of course, I did manage to get a few cards made! 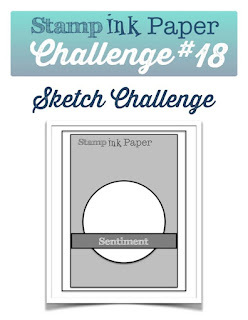 Since it is Tuesday, that means time for another Stamp, Ink, Paper Challenge and this week it's an awesome sketch! Of course since I had trees stamped at the bottom of that layer, I needed to turn the sketch upside down so that the sentiment was at the top. 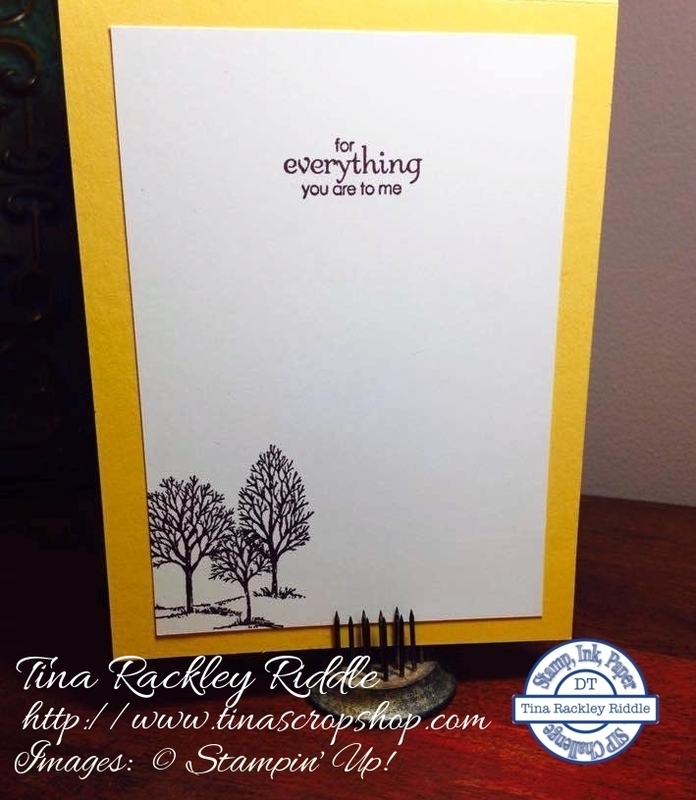 I just adore my well loved Lovely as a Tree stamp set and it was perfect on this card. 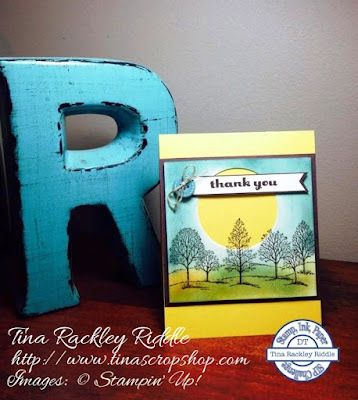 I had recently seen a card on Pinterest that used this negative spotlighting technique thanks to my sweet friend, Shelley Glassco. For a link to the Pin she sent me, click here It's a super easy technique as once you stamp and then die cut the circle, you just stamp the same portion of the image on cardstock the same color as your base and line it up and then cut it to fit under your other stamped image. Once I had it lined up, I taped it down with Washi tape and then adhered it to my Chocolate Chip layer with Dimensionals. It really gives the appearance that you had stamped the image on the base and the upper portion and that it just magically lined up. Anyone that has stamped with me, knows that is an impossibility. lol I really wanted the grassline and hills on the tree line duplicated behind the trees so I used my Early Espresso Stampin' Write marker and just drew then in as close as possible to the hills on the stamp. I'm actually pretty happy with how that turned out! The Thank you sentiment on the banner was from my retired Definitely Dahlia stamp set. I really liked the size and the boldness of the font on this one. On the inside layer, I added sentiment from another vintage set, Petite Pairs and then stamped some of the same trees on the lower left. That was it for this card. I always love tree cards, yours is beautiful. What a clever way to use the sketch, turning the circle into the sun. That banner triple punch is cool, I'm still doing the handcutting thing, hoping it looks even, lol! What a great idea to use the sun as the circle in the sketch, Tina! Love the gorgeous scene you've created. Beautiful use of color.